Rebalancing is all about keeping you on track to reaching your investment goals. You meet periodically with your financial planner to review your investment goals. You mutually agree on a target asset allocation that best positions you to meet your objects. This strategic allocation sets the optimal balance between your required return and risk tolerance. It follows then that any significant deviation from your target allocation is less than optimal. Now, your portfolio manager executes the necessary trades, monitors your accounts and makes adjustments so that you stay on target. This last part is called “rebalancing” your portfolio. Rebalancing is all about keeping you on track to reaching your investment goals. Over time, your goals and circumstances may change. Market conditions and expectations change. These changes may require adjustments to your optimal asset allocation. Market prices also change and can cause your portfolio’s risk exposure to drift. Rebalancing brings your portfolio back to its optimal target allocation and risk exposure. The primary benefit of rebalancing is avoiding the cost of failing to meet your long term financial goals. Having worked as an engineer, I learned early that the cost of quality is the cost of doing things wrong. You can pay the upfront cost of producing a quality product, or you can pay the cost of failure down the road. The primary benefit of rebalancing is avoiding the cost of failing to meet your long term financial goals. But rebalancing comes at a financial cost, mainly transaction costs and taxes. The benefits of rebalancing must outweigh this cost hurdle for the exercise to make sense. The cumulative erosive effect of transaction costs on performance can never be recovered. Transaction costs come in many forms from transparent broker’s transaction fees, to less obvious bid-ask spreads and quality of execution. Illiquid assets exacerbate the issue. For taxable accounts, taxes are usually the largest cost of rebalancing. Marginal tax brackets and different tax treatment of long and short-term gains require a fluid and asymmetric rebalancing plan. All else equal, the order of precedence is selling short-term losses, then long-term losses, long-term gains, and short-term gains. 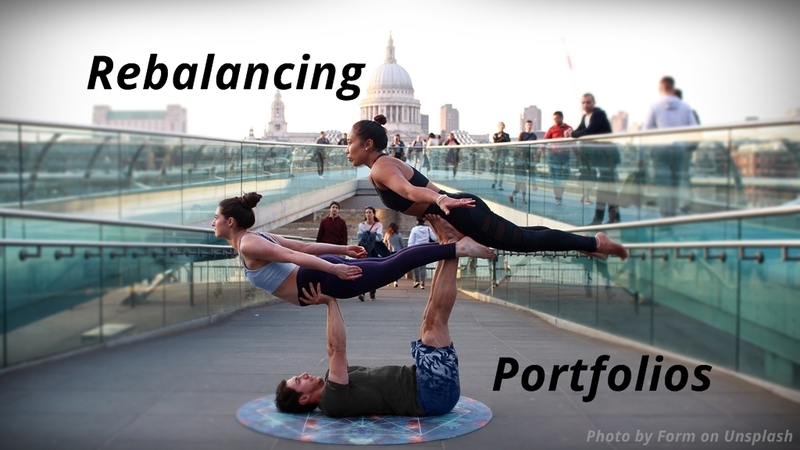 When or how often should you rebalance your portfolio? The answer in part depends on your time constraints and risk tolerance. There are many rebalancing methods to help meet your needs. Here are three of the most popular. Calendar rebalancing is the simplest and most popular method among do-it-yourself investors. It does not require constant monitoring of your portfolio. Rebalancing is executed periodically, typically on a quarterly basis. Depending on your portfolio’s volatility, a quarterly review may be more than adequate. Calendar rebalancing is the simplest and most popular method among do-it-yourself investors. A good time to rebalance is when you or your planner regularly review your accounts. For your 401k or 403b, your plan may restrict when or how often you make allocation changes. You can rebalance by redistributing your current holdings or changing how future contributions are invested. The main drawback of calendar rebalancing is that timing is unrelated to the actual causes of portfolio drift, like market movement. In any period, your portfolio can be off-target by a little or a lot. Calendar rebalancing is as arbitrary as it is simple in nature. Interval rebalancing sets an acceptable range or band around each asset class’s allocation. Rebalancing is triggered whenever any asset drifts beyond its designated thresholds. Interval rebalancing is also known as “percentage-of-portfolio” or “percentage-range” rebalancing because the bands or corridors are set as a percentage of the portfolio’s value. For instance, a target equity allocation of 60% +/-10% can drift between 54% and 66% of the portfolio’s total value without triggering rebalancing. Interval rebalancing is directly linked to market movement. But it requires more frequent monitoring. Deliberate design of corridor widths can reduce transaction costs. An asset class’s corridor may be widened when transaction costs, risk tolerance, and asset class correlations increase. A corridor should be narrowed when volatility increases, all else equal. Unlike calendar rebalancing, interval rebalancing is directly linked to market movement. It provides tighter control over risk exposure and transaction costs. But it requires more frequent monitoring. Buy & Hold – Rebalancing NOT! Buy and hold is a method of rebalancing. I like to call it “rebalancing – not!” Other methods are a “do something” or dynamic strategy. Buy and hold is a “do nothing” or passive strategy allowing allocations to drift. There are advantages specific to buy and hold besides doing nothing. There are no realized transaction or tax costs. But there is another less obvious advantage which I shall explain. The buy and hold investor’s highest risk exposure is at the top of a bull market. Calendar and interval rebalancing are constant-mix strategies which work well in side-ways markets where reversals dominate. Market movement triggers buying when prices are lower and selling when prices are higher. Therefore, they underperform buy and hold in strongly trending up or down markets. Imagine a portfolio allocated to 60% equities and 40% cash equivalents. As stock prices rise 50%, the portfolio drifts towards 70% equities. Equity allocation automatically adjusts higher in bull markets, and lower in bear markets1. However, the buy and hold investor’s highest risk exposure is at the top of a bull market. Meanwhile, the constant-mix investor is buying into a downtrend and selling into an uptrend2. Which strategy makes more sense to you? Is there a better way? When my son began medical school, we drove together from our home in Arizona to Emory University in Georgia. I engaged the cruise control for the long trip. We hit a stretch of rolling hills that went on forever. The transmission shifted rudely as the cruise control struggled to maintain a constant speed. But by increasing speed just enough at the start of each hill, we could let off the gas near the top and keep the cruise control engaged. It quickly became a contest who could apply the least gas without triggering the transmission to downshift! That’s tactical rebalancing in a nutshell. At Coherent, we begin with a long-term multi-horizon strategic allocation designed for each client as part of their overall financial plan. We employ a combination of tactical rebalancing strategies, depending on what makes most sense. We monitor portfolios and the markets daily. Everyone’s different. Our goal is that each client achieves their long term financial goals. When markets are trending upwards, we allow allocations to drift. When markets have priced in excessively optimistic expectations, we begin rebalancing portfolios back to target. In some markets, we will rebalance well below target. We do everything possible to minimize transaction and tax costs. Cash flows from deposits, withdrawals, and dividends offset rebalancing. Tax constraints are managed over time. We will hedge using derivatives when the benefits outweigh trading the underlying securities. This is an oversimplified explanation, but it suffices in our context for making general comparisons between these three popular rebalancing methods. In practice there are many variables to consider, not the least of which is market timing. For investors whose risk tolerances increases and decreases with their wealth level and market returns, buy and hold may make sense. For those whose risk tolerance changes proportionately with their wealth level and like to own equities at all levels of wealth, then a constant-mix strategy may be more suitable.